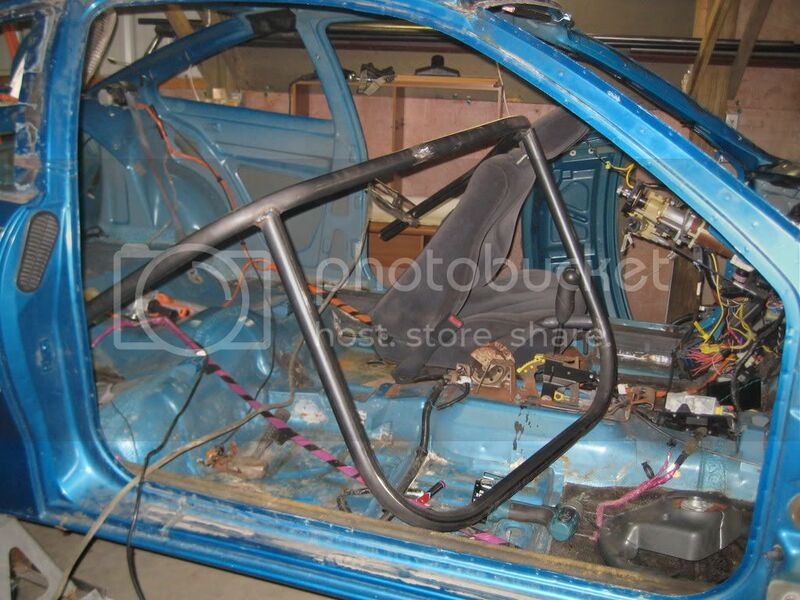 I am in the process of building a new race car. 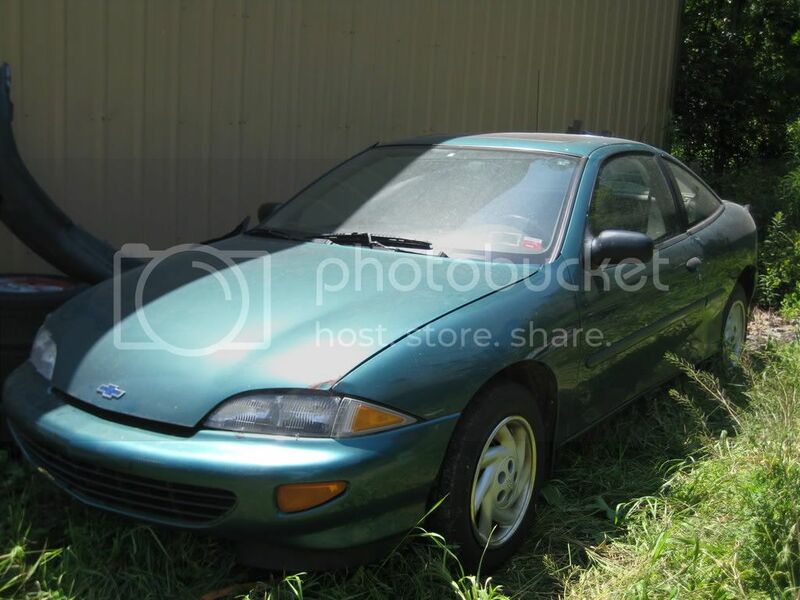 This is a 1995 cav. that I saved from the junk yard Two years ago. I am just starting this project now and need to have complete by Mid March. Sounds like a long time but it goes by fast. I will keep this post updated if there is any interest in seeing this project cometogether. 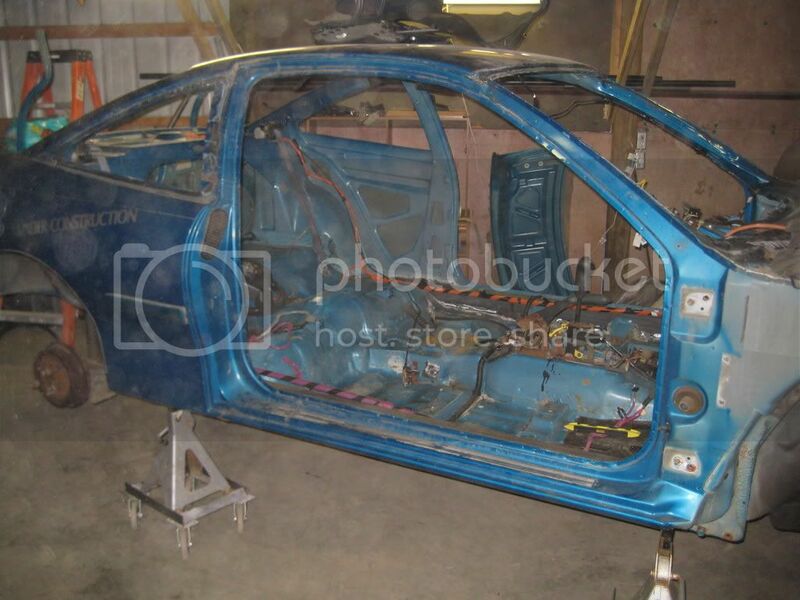 Any ideas and suggestions are welcome, as this is my first Cavalier build. If anyone would want to see my current race car, you can check it out here. Im interested if it actually gets done. Good luck to ya. Just out of curiosity, why a cavalier for dirt track. Thank You!! This will get done and it will be awesome. this hopefully will be the nicest dirt track 4 cyl. ever. 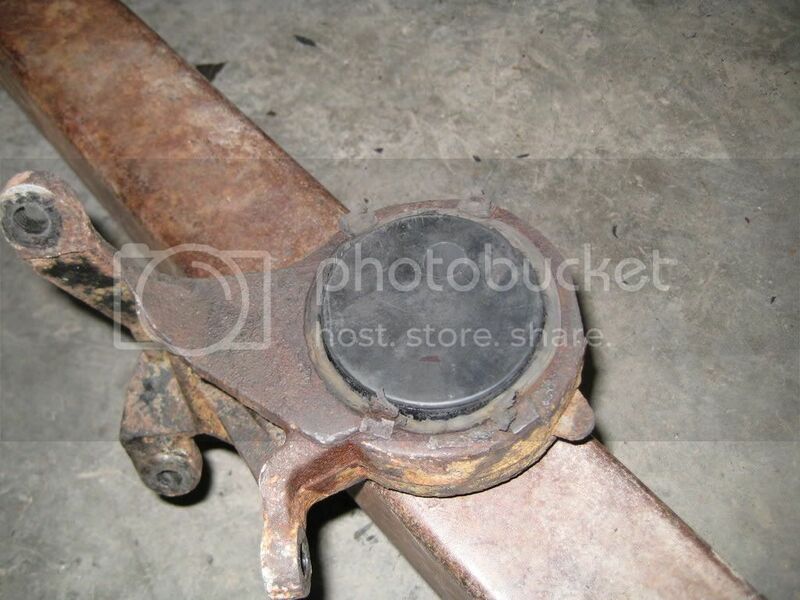 I picked this because parts are readily available, unlike my toyota's. 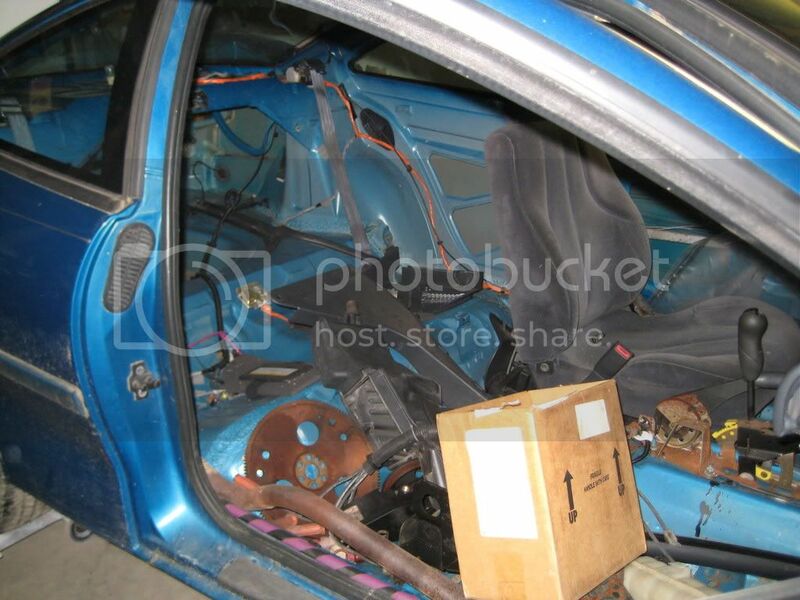 I believe this car will work just fine. I just picked up a 96 5-speed for a parts car. I'll post some update pics. 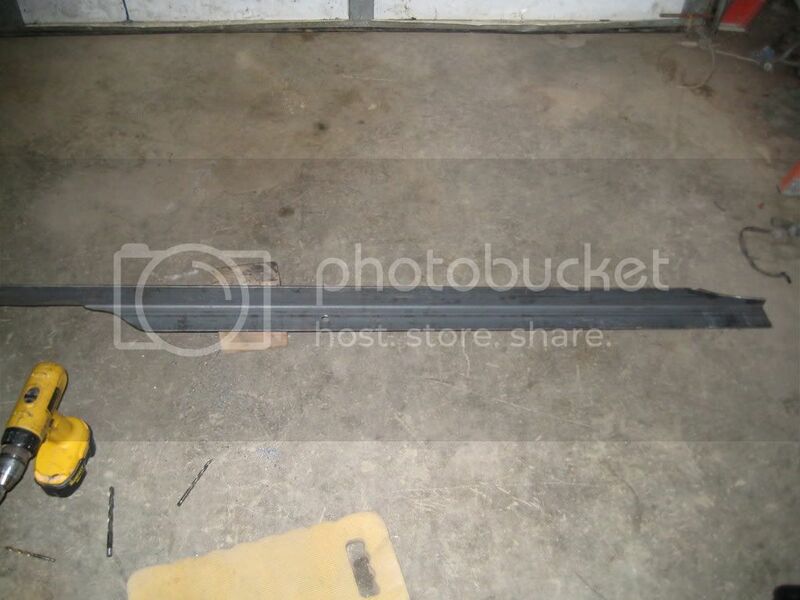 We're building a 02+ for a 1/4 asphalt track. Well destroying it really. 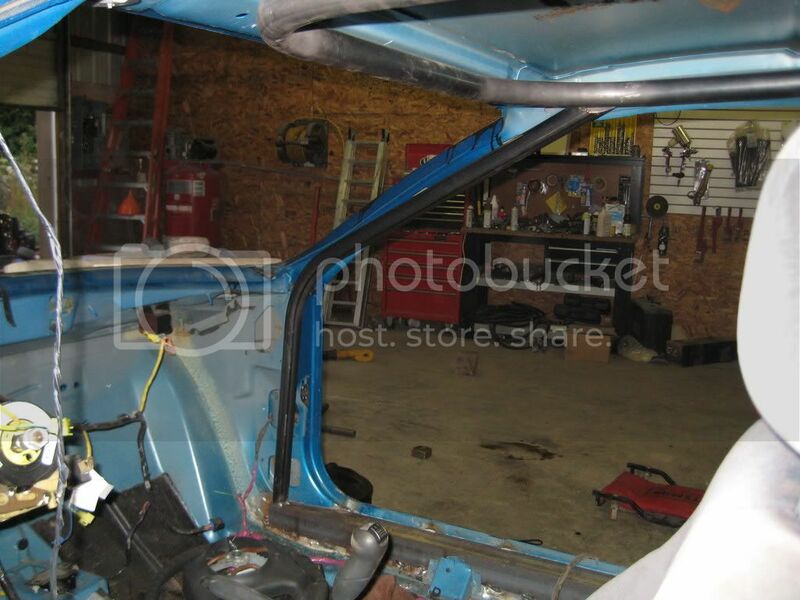 Gotta be completely stock and totally gutted out. Lights and horn must work still though. 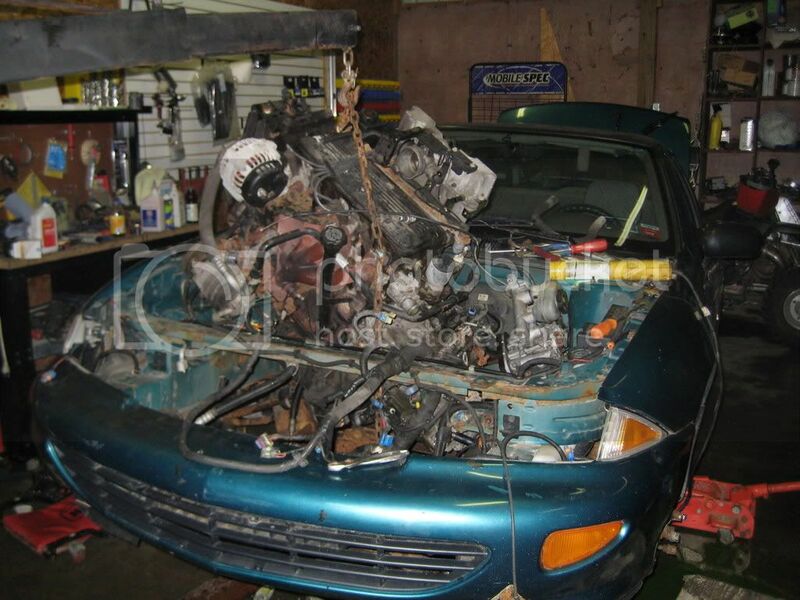 we just found a '03 for under scrap yard price. 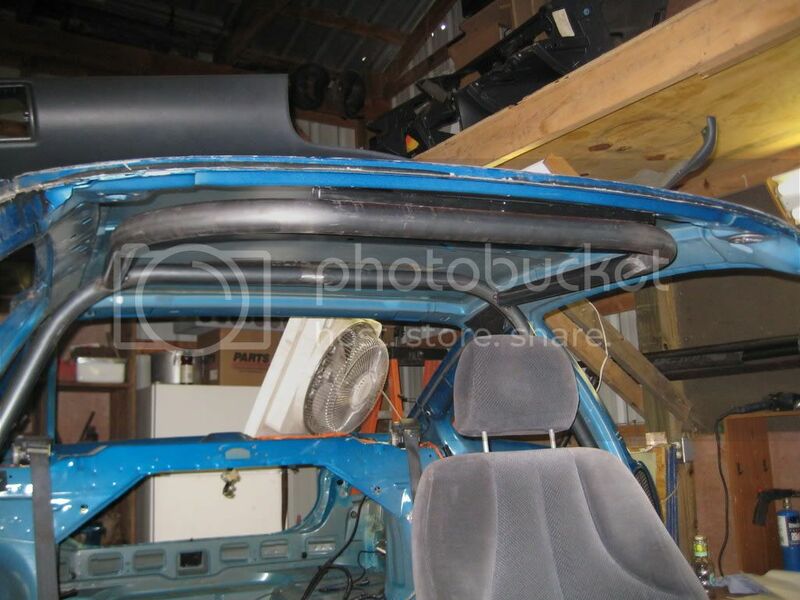 Its getting a cage put in it now, and I can't wait. J-body cars have been dominating our local dirt tracks all year. Well Thanks for all the replies fellas. 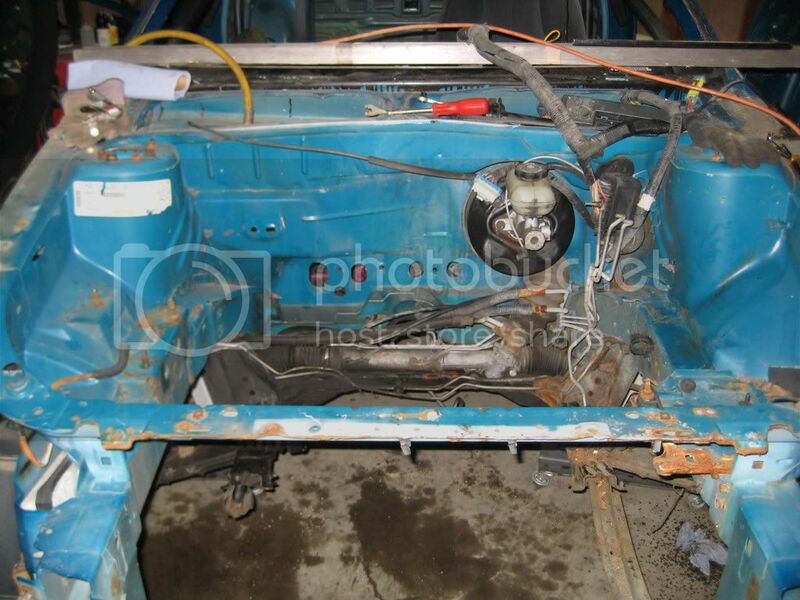 Ive been pretty busy w/ work and around my house but I have been able to get a little work done on this car. 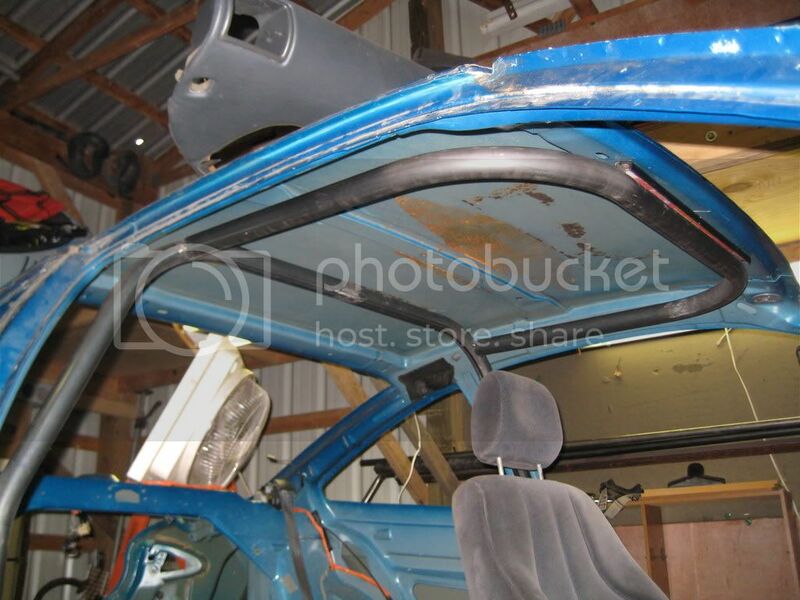 This is the start of the roll cage. 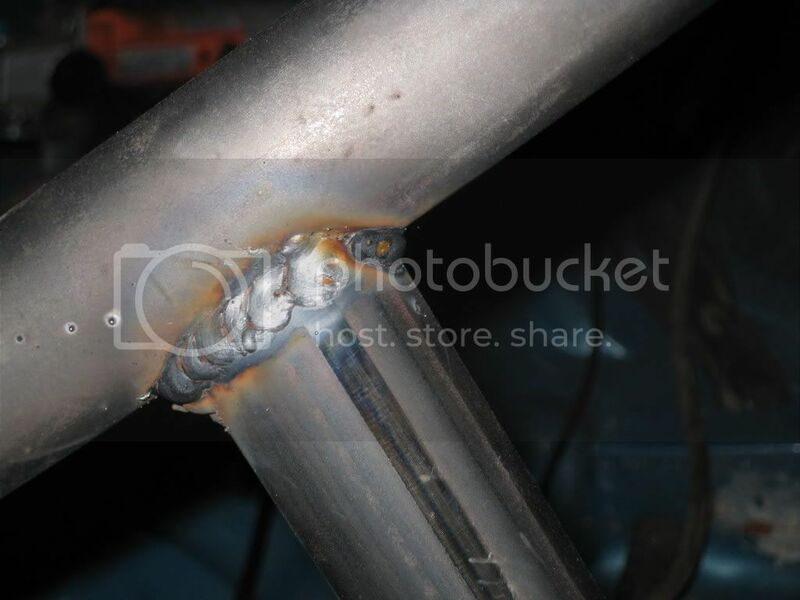 I just tack welded the main hoop so I could pull this down and weld the whole way around. 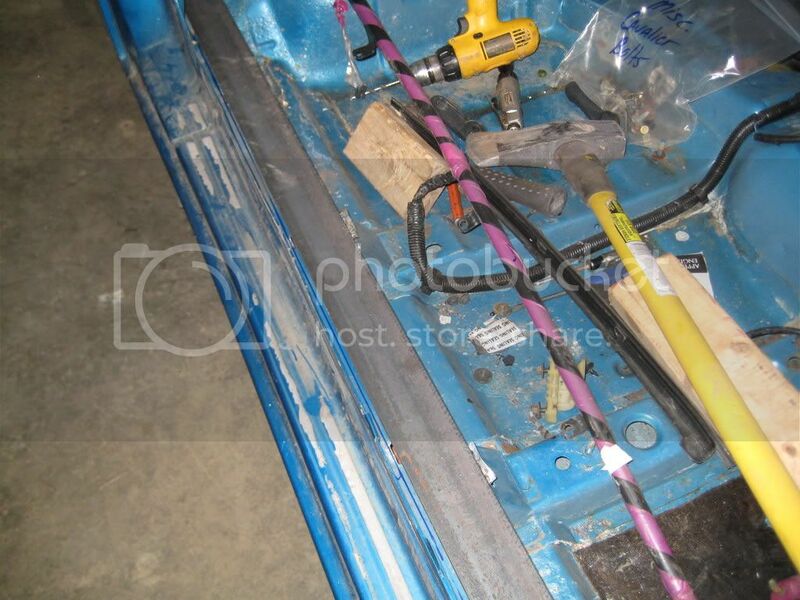 This is as far as Ive gotten, I still need to mock up the drivers side A pillar bar. 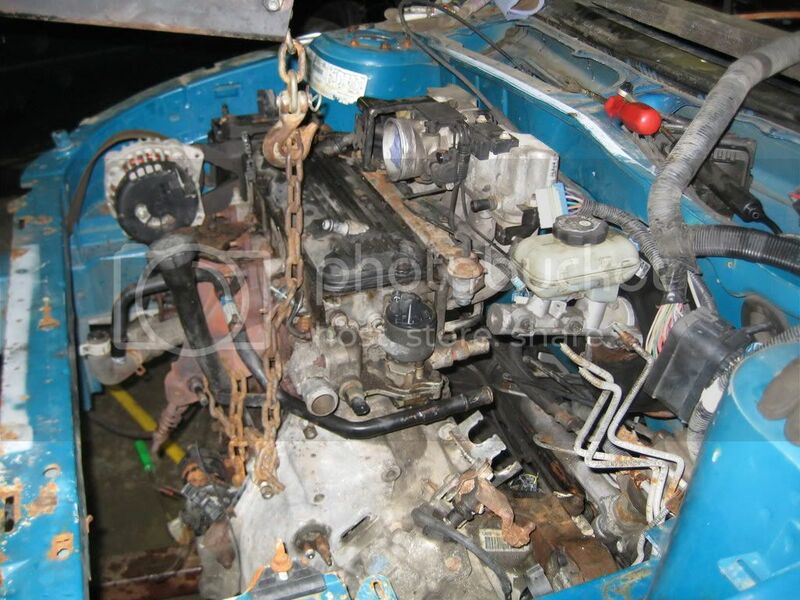 This is the parts car I bought, It has a 5 speed in it my car has the 3 speed. Any one have any suggestions as to which one would be the better route to go with? If the pictures are to much to be posting on this site just let me know, not sure what that the rules are. Also I'm open to any suggestions and ideas. Which transmission really depends on the track. Obviously you don't want to be shifting the 5-speed because you've run out of RPM over half way down the straight... The auto will give you a wider speed range. I've seen some guys on here who could go the entire race in 2nd gear on a 3-speed, which would be a decent advantage. Yea shifting is not an option. The track is 3/8 mile, fair amount of banking, tight turns w/ long strait aways. My current car is a tercel, 4 speed, second gear screams at 6800 rpm at the end of the straits. But 3rd just wont pull out of the hole. So I just run 2nd and it hasn't blown up yet. I thought that I was going to run the auto in second till I got this parts car now I'm unsure. Cant I put some locker in that trans (an LDS or something?) also I found some sites tell how to use different chains and sprockets to change the gear ratio on the 3 speed so you can dial it in a little better. I don't think that is an option on the 5 speed? Also I will be running 15" tires so I will have a better assortment to choose from. Anyone who has experimented w/ this feel free to chime in here! You can get an LSD from Phantomgrip, or Team Green has offered to make one if someone sends them a diff. Cool, feel free to share any advice to a new J body racer! The local track here is dominated bY J's I have the pictures and video to prove it good luck on your build. Well, your definitely on the right site, the guys on here seem to know their stuff. I miss my Sunfire, I want it back! I want to see those. not because I don't believe you, but because that would be awesome to see. The auto to manual swap is not as involved as you would think. Get all the parts you need in a pile, and drive the car into it. They will find their way into the correct places. Thanks for the replies guys. I got a little more done last night. We had our season finale 30 lap race scheduled last night, but mother nature put that on hold. So the only logical thing to do was work on the new race car. I got the major Four points of the cage done and fully welded, I'm about 90% happy w/ the outcome of this, but it will work. 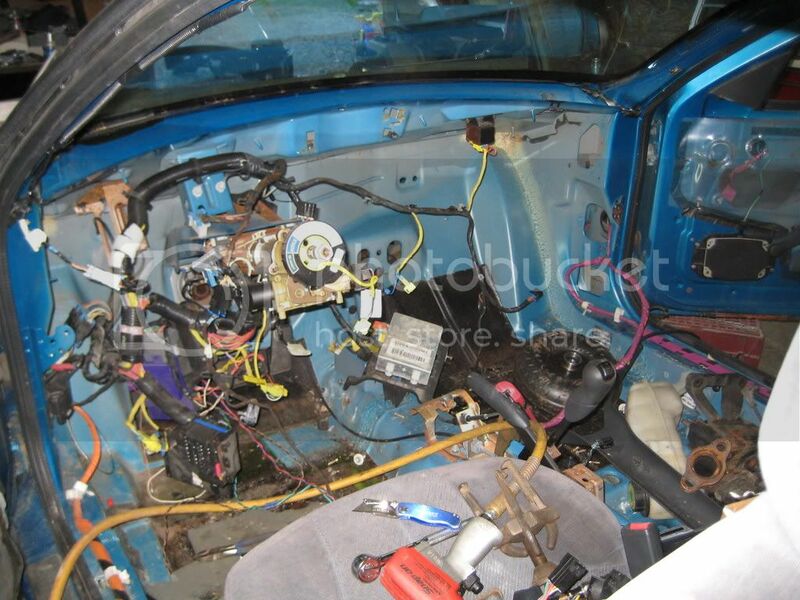 Also I removed the auto trans from the car. I was going to run the auto but have decided to go w/ the 5 speed. Today I plan on starting that swap. 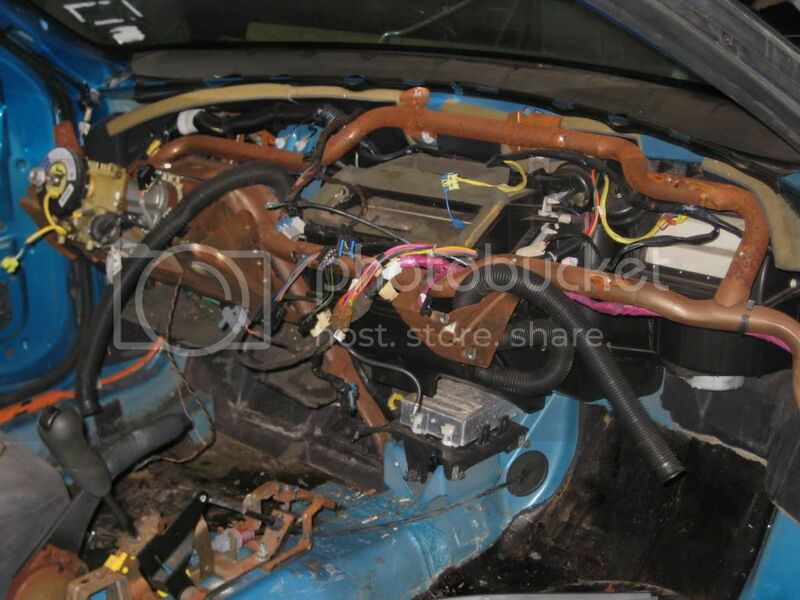 I never had this car running so I want to get it running before I do much more. 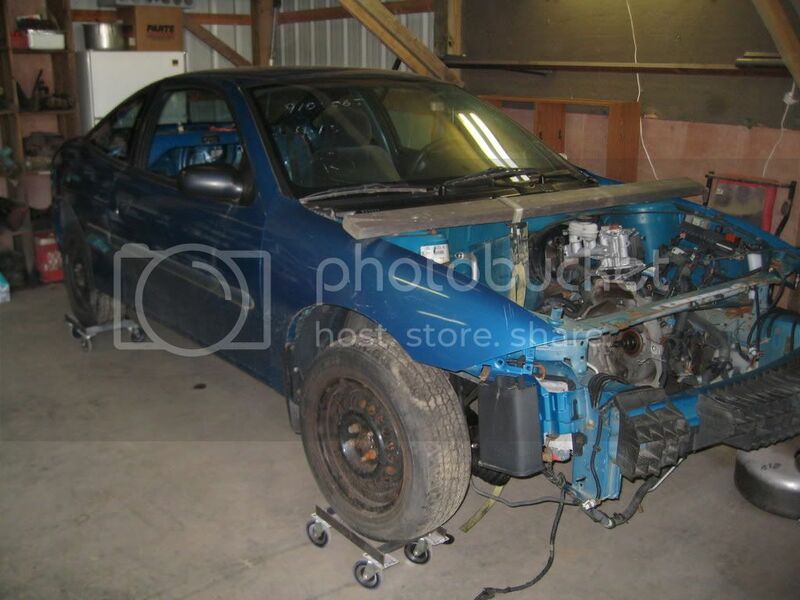 I have no doubt that it will run, I have a running parts car. Feel free, I would have changed things a little the next time. Do you have a TUBING bender? I'm trying to make this car really slick, I'm going for the nicest dirt 4 cyl ever!! our rules say "dash must remain stock, you can cut dash for cage." 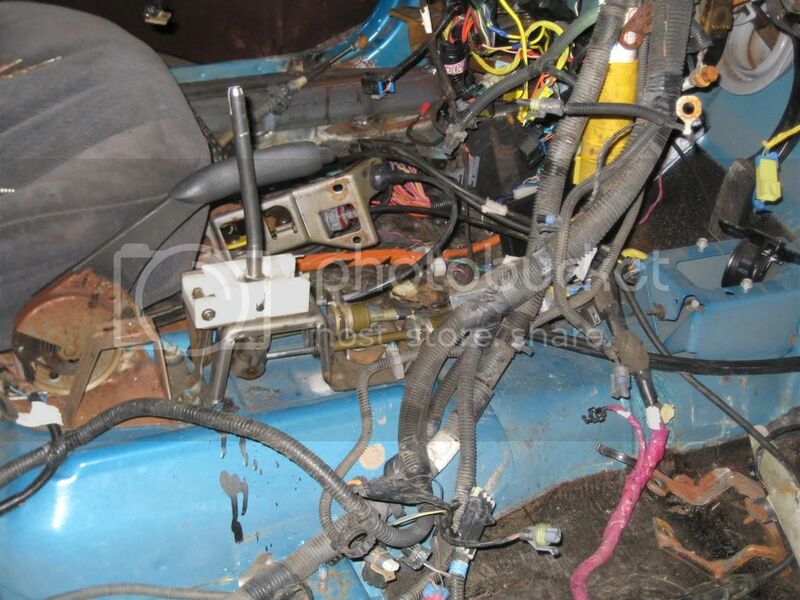 If you look at the last picture you can see that the A pillar tube is in front of the dash mounting tab, It was harder to do it that way, but the plan is to put just the plastic dash back in and have the roll cage disappear down through it. I could easily have ran the A pillars out away from the dash, But like I said I'm trying to be as creative as I can. Also this is safer being the cage is further out by your feet. Nightmares cavy I would like to see some of those pics as well. I'll try to get a couple updated pics tonight or tomorrow depending on how much I get done. 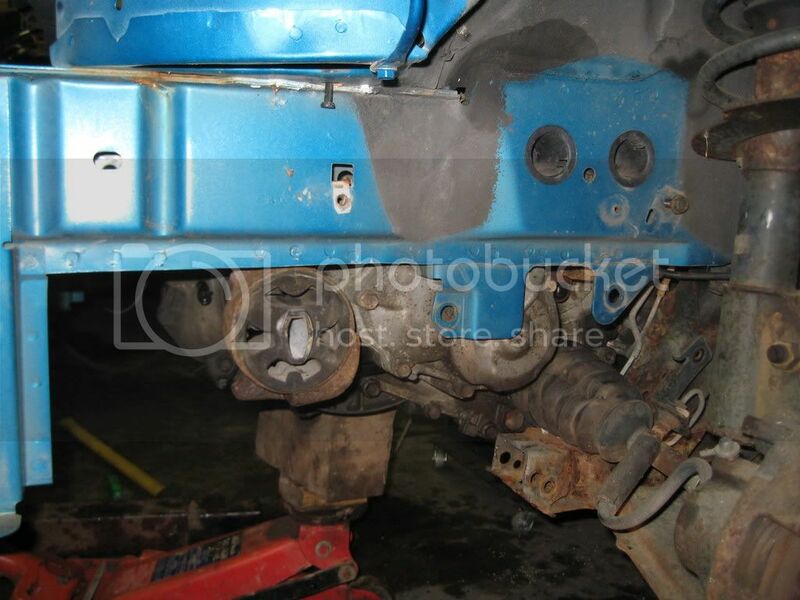 Pulling the motor and trans out of the parts car...what a pain! 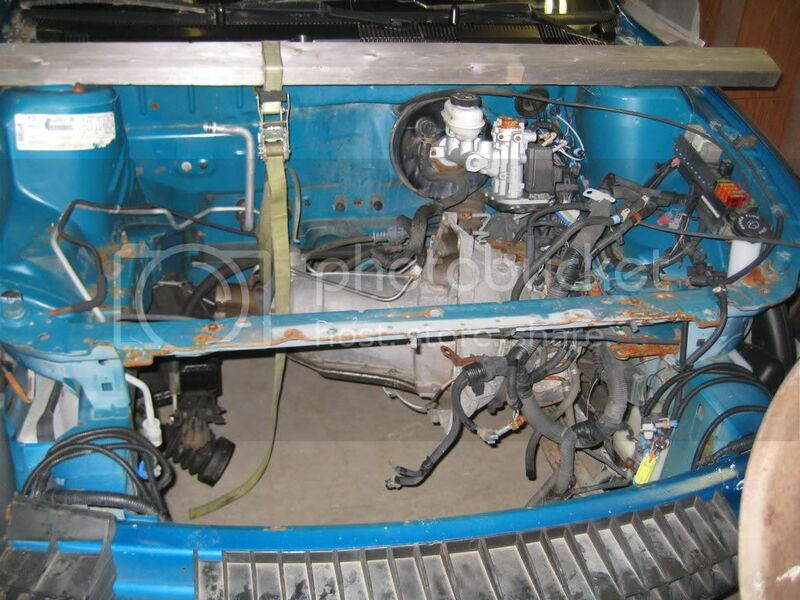 here's the race car engine bay all ready to fit the motor and trans in to start mocking up the new trans mounts. 5 speed shifter installed, this was easy...The clutch pedal removal on the other hand was another story! 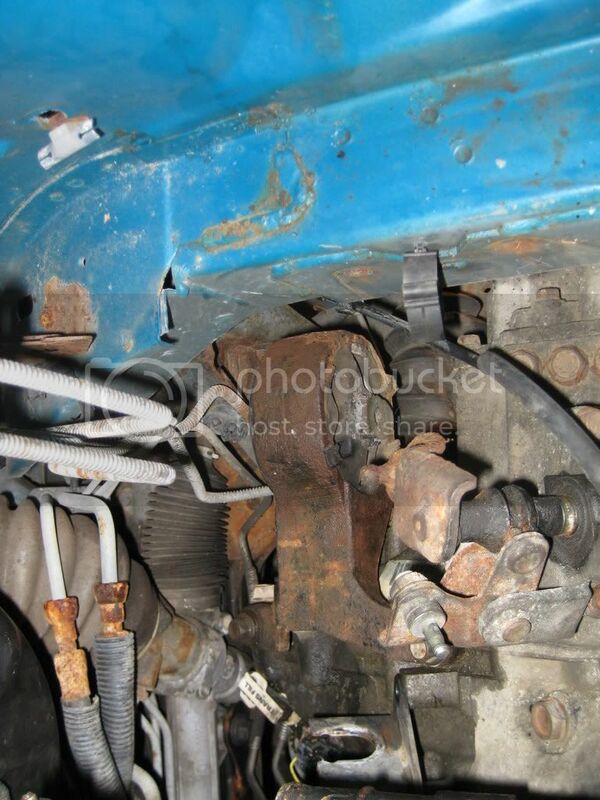 The Craig's List ad said "minor frame damage" I called and said if the car starts and runs I'll take it. 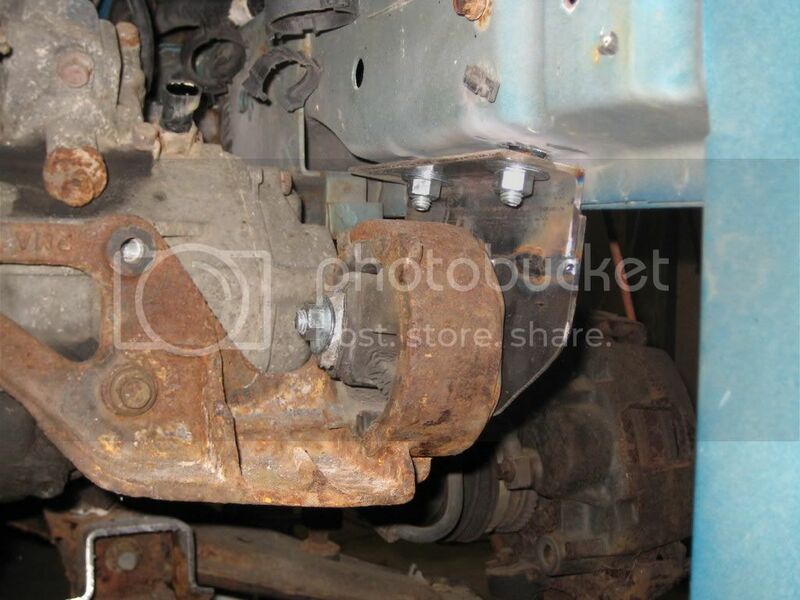 She than said "you know you cant drive it right?" "No problem" I said, " I'll bring a trailer. She never told me the front tire was hanging out from the fender and It wouldn't pull up onto the trailer. What a day that was!!!! 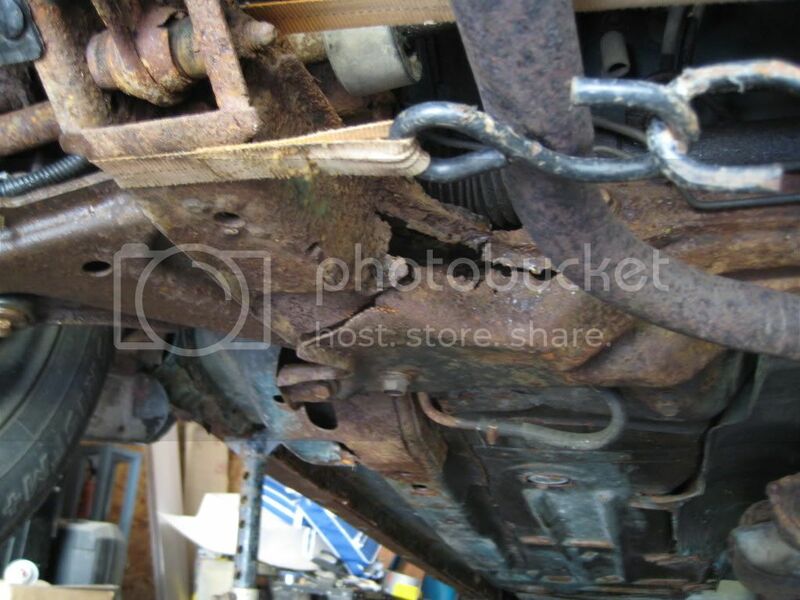 Fortunately, the subframe is easily replaced. This is on the parts car. I will only be taking what I can use off and the rest will go to the scrap yard. It will never be replaced. 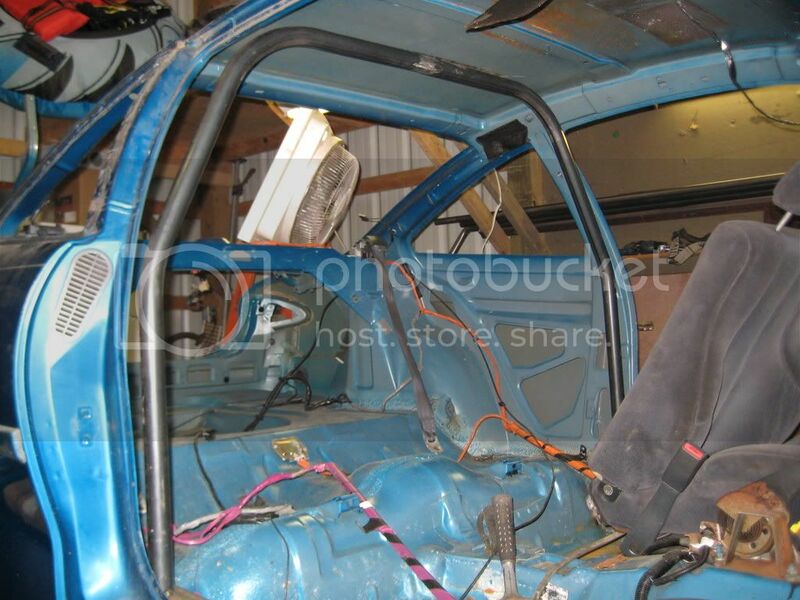 My race car is very solid, I would never put money into something like this parts car. 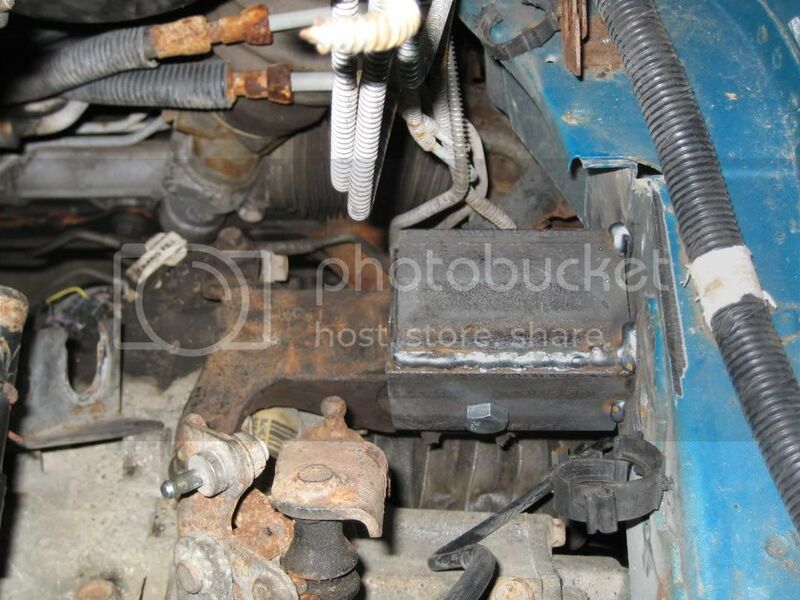 Well I had a little time to work on the car and pretty mush got the motor mounts finished. 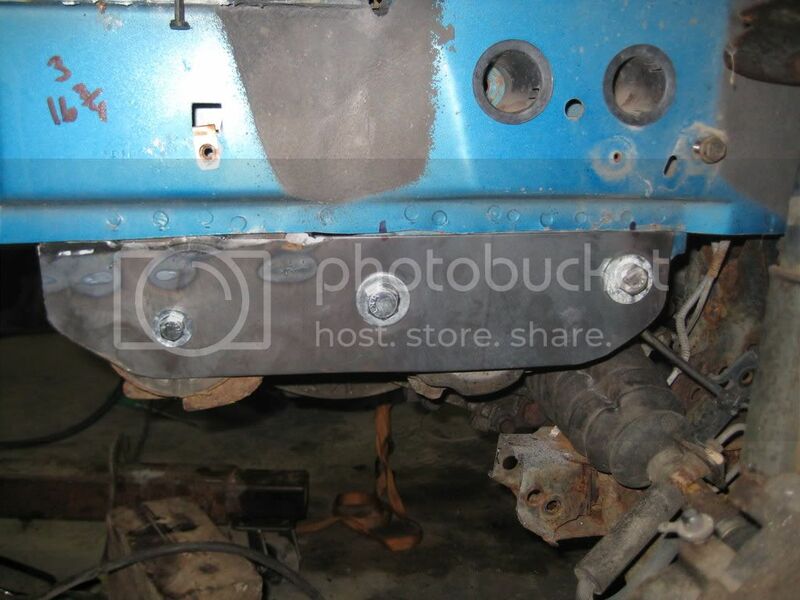 The rear mount just tack welded in place. Custom rear trans. mount. Two hockey pucks, I wish I could take credit for this but I got this idea for someone on the TercelOnline.com Forum. 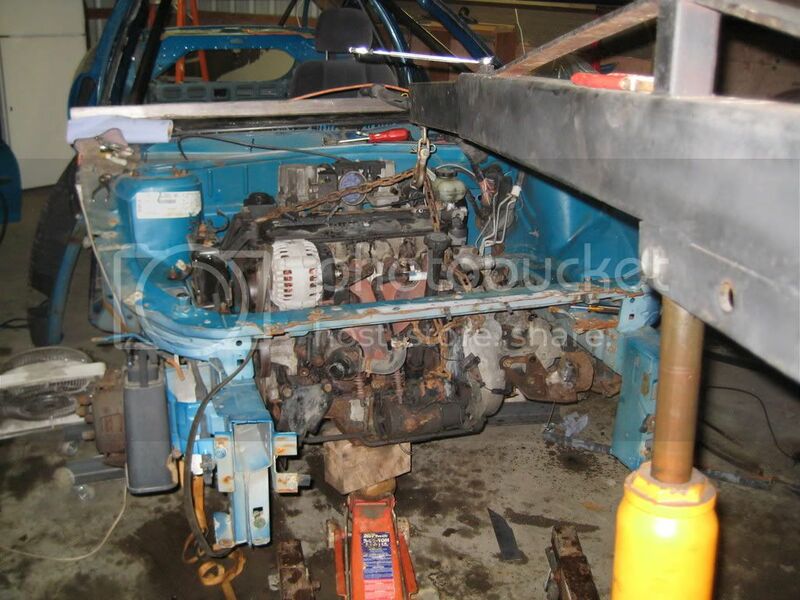 Well that's it for now, I still need to pull the motor back out and weld the rear mount up solid. 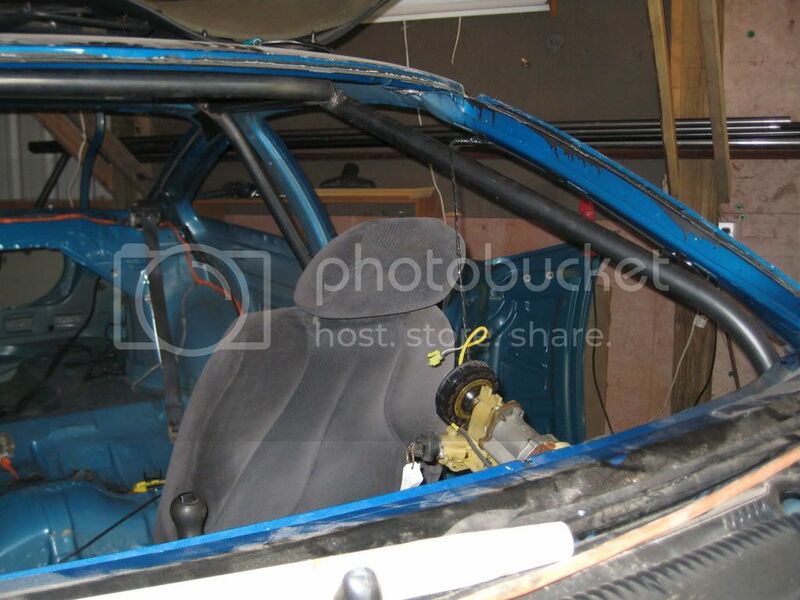 Hey everyone im new to this site as a user, i never signed up.....i saw u were posting pictures of your build so i wanted to show everyone my racecar. 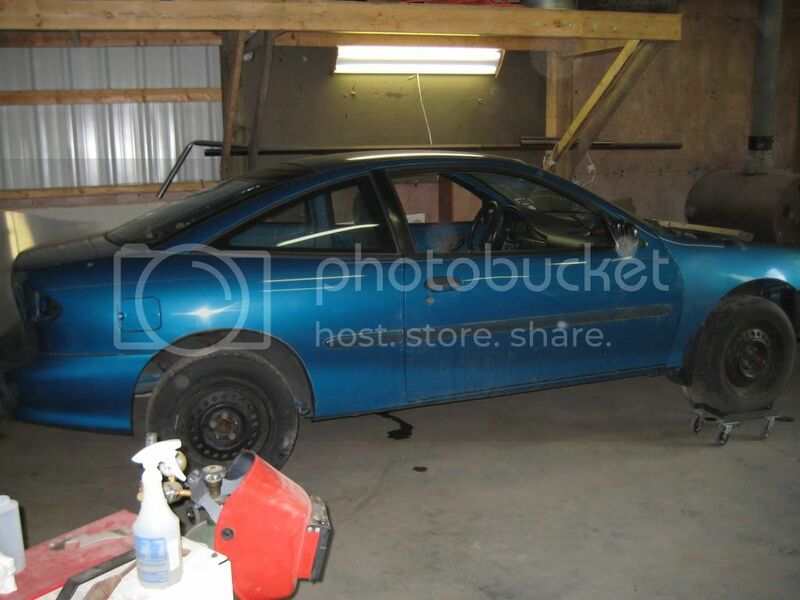 This is a picture of my sunfire/cavalier i used to win the track championship at a local 1/2 mile dirt track. hey just figured id throw in another picture of the car, hopefully i have some action photos up soon if anyone is interested. if you need some help or advice im sure i could point you in the right direction. 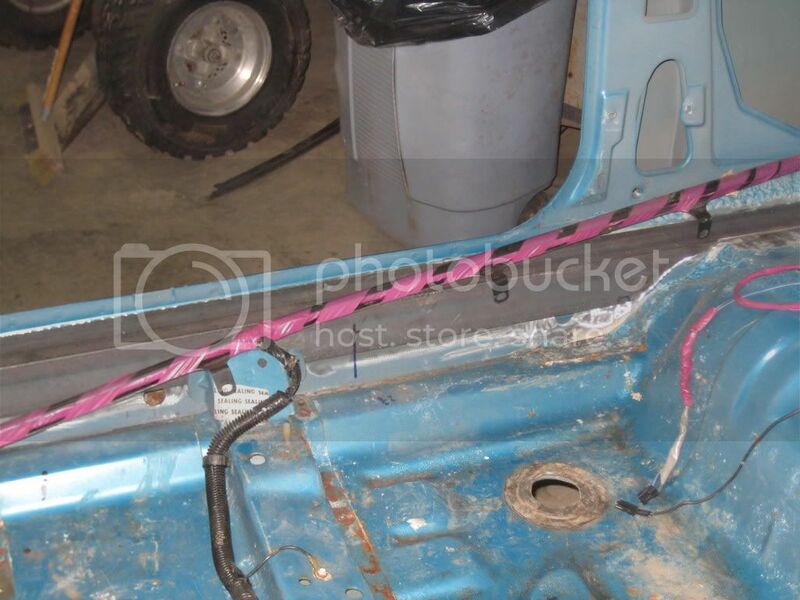 Id like to know what you j-body guys think of my car so let me know.